Repent(Teshuva) – Bringing heaven (shekinah) down to the Earth. Taking forward the mission of Mashiach ben Yosef (The spirit of Living Torah) onto the holy land. Keter is so “close” to Eyn Sof itself, that little can be known about it. It represents the eternal depth of riches of Eyn Sof. Chokmah is Godly wisdom and the first Sephirah that can be known in some way. 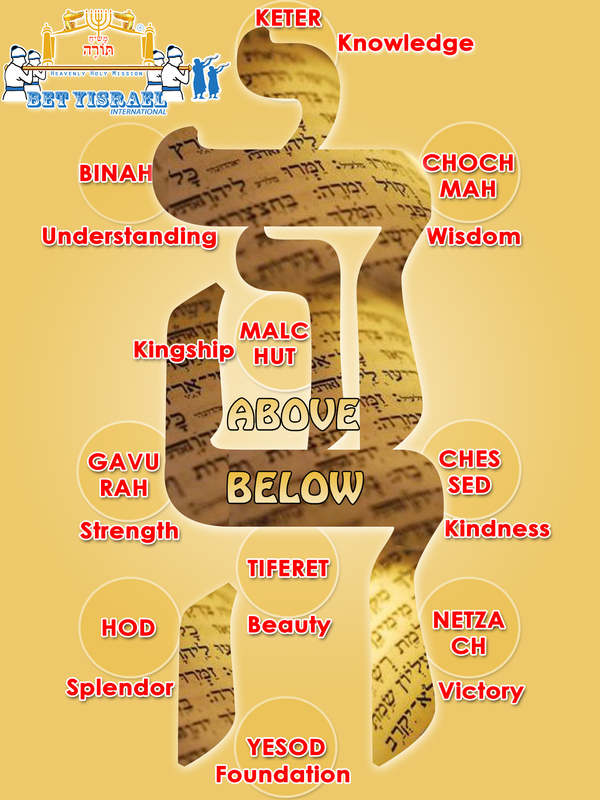 Binah is understanding/knowledge, the counterpart to Chokmah. Chesed symbolizes love and mercy in Scripture. It is the “natural way” of G-d.
Gevurah the counterpart to Chesed, symbolizes justice and severity in Scripture. Tiferet has a central relationship to all of the other Sephirot, and an involvement with the unification of the Sephirot and the name of G-d.
Netzach and Hod are considered to be the conductors through which G-d’s essence is conveyed between the upper realms and the lower ones. Malkut is ASSOCIATED with the “glory” (Shekinah) of Most High. In the book of the “New Testament” in the form of Yeshua being, “the image of the invisible Most High or ”Tree of Life”. Paul’s Deeper letters, we can find a hidden reference to the ten Sephirot. and knowledge of Most High! The ten sefirot or the ten emanations of Hashem’s divine attributes is an exclusively Jewish concept. But you can find the Paul writings in New Testament of ten sefirot – Tree of Life. As the Sephirotic “Tree of Life” is in the image of Elohim. As Paul mentions, the things seen of Most High are there for a purpose — for us to learn of and become conformed to the image of Elohim. Yaacob (Tiferet/Zeir Anpin) is the one who connects the two females, binding the upper spiritual (Binah – the “gateway” to the upper triad of Binah-Chokmah-Keter) to the lower spiritual (Malkut – the spiritual aspect of the physical world). Yaacob cannot do this without the “Tzaddik” – Yoseph (Yesod) who has a critical role in defeating Esau – As it is written: Obadiah 1:18 – And the house of Jacob shall be fire, and the house of Joseph flame, and the house of Esau for stubble. Matthew 6:33 – But seek ye first the kingdom of Most High [i.e., Malkut], and his righteousness [the path of the Tzaddik], and all these things shall be added unto you. Matthew 7:14 – Because strait is the gate and narrow is the way [i.e., the path of the Tzaddik, confirmed to his image], which leads unto life, and few there be that find it.